I started running green wood courses in 1985, initially near Bristol, then in Devon, and since 1995, in Herefordshire: for 10 years at Clissett Wood and for 11 years at Brookhouse Wood. With each move, I have taken the opportunity to refine the content and format of the courses and to improve the facilities based to a large extent on feedback from students https://goingwiththegrain.org/course-feedback/. 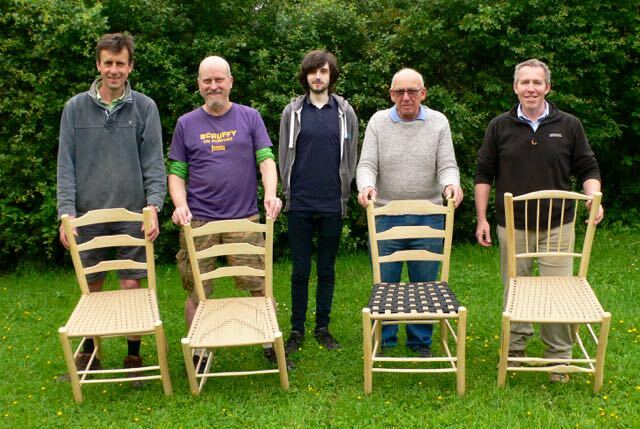 Over the years, I have found that of all the green woodworking projects on offer, it is the making of a chair that has proved most popular and rewarding for course participants. The courses usually run for 5 days and are limited to four students. All necessary tools, equipment and green wood will be provided but you are welcome to bring your own. For those who have not been on a chair-making course before, you are advised to keep to one of the more straightforward chair making projects, usually making a spindle-back chair. For those who have attended a previous course, then the favourite option is to make a trade-mark lath-back chair, a style that evolved over the years in my workshop at Brookhouse Wood. In 2018 we experimented with a range of more elaborate courses. Let’s see what you can make in 5 days! The above courses were on the whole, good fun and fulfilling but also rather frantic at times, so in 2019, we shall be returning to the simple 5-day courses, during which we shall make spindle-backs (for beginners) and lath-backs (for those with experience). Courses run from 9am to 6pm each day with about an hour’s break at lunchtime during which I can take my 20-minute ‘siesta’. The first 2 days are spent making the components for the chairs, using the processes of cleaving, shaving, tenoning and steam-bending. With the aid of a tight schedule for drying the components, the following 2 days are spent assembling the chairs. The last day is spent weaving the seat, usually with Danish cord, weaving patterns that have evolved on my courses over the years. The cost of the chair-making ash plus seating materials as well as hot drinks and a light lunch are included in the course fee of £480. In August 2018 I announced course dates for the coming year on my Mailchimp newsletter, which you can sign up to here: newsletter link. Over half of the course places were booked within a few weeks, and by mid October the places were all filled, so this year I added another course for May to ease the waiting list. There will undoubtedly be some cancellations, so please e-mail me to find out the current situation and put yourself on the waiting list. The dates are listed below. Alternatively I can e-mail you a list of other courses at other venues to suit all levels. From Spring 2019, (in hopeful anticipation of still being of sufficiently sound body and mind at the age of 69) I shall start on the programme for 2020, so if you can’t get on a course in 2019, please put yourself on the waiting list. 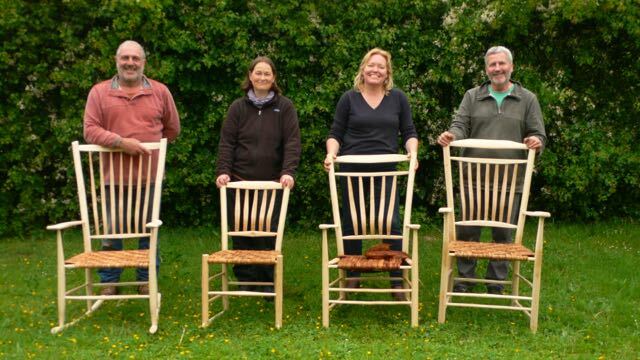 What will you take away from a green wood Chair-making course? Probably the most lasting memory will come from the experience of working with a group of like-minded people in a peaceful environment away from the pressures of everyday life. Greenwood Cottage is located in a rural hamlet in East Herefordshire, midway between the cities of Hereford and Worcester. Green wood and basic seating materials will be included in the price of the course but there may be a charge for any other materials that have to be bought in, such as unusual seating material for chairs. A light lunch plus hot or cold drinks will be provided each day and included in the price. There will be no on-site accommodation available at Greenwood Cottage but there are many alternatives in the area. We can notify you of some recommended options when you book a course place. Each day will run from 9am to 6pm with an hour break for lunch.